Featuring the ingredients of the traditional Caesar salad, this hearty, yet easy-to-make, soup is the perfect dish to serve on a busy weeknight. Heat oil in large saucepan on medium heat. Add onions, hot sauce and lemon zest; cook 2 min., stirring occasionally. Add all remaining ingredients except shrimp; mix well. Bring to boil; simmer on medium-low heat 10 min., stirring occasionally. Add shrimp; cook 3 to 4 min. or just until done, stirring occasionally. Sprinkle celery salt into pie plate. 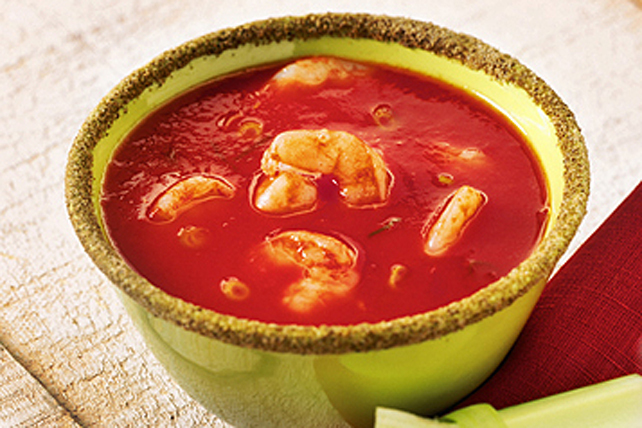 Rub lime wedge around rim of each soup bowl, then dip rim in celery salt, turning to evenly coat rim with salt. Fill with hot soup just before serving. Garnish each filled soup bowl with 1 tsp. thin red chile slices and 1/4 cup chopped fresh cilantro before serving.